These strong, sometimes tough and aggressive people inspire awe and respect. Powerful Scorpions, who have received the cunning of the Rat, are practically invulnerable to any adversaries. Therefore, it is better to maintain good relations with them. They are well versed in people, have a strong intuition, are not afraid of difficulties, endure trouble. Scorpio-Rat — one of the strongest signs of the zodiac horoscope. For this person there are no impossible tasks, he always achieves his own and no matter what ways. He prefers to act swiftly and decisively, does not waste time on unnecessary thinking and empty talk. Too proud and independent to take an interest in someone else’s opinion. Rat-Scorpio — a remarkable character, which causes a whole range of feelings, except indifference. With this strong person you can be friends or enemies. At times, he causes irritation, at times — admiration, but never goes unnoticed. So confident in himself that no one will allow to interfere in personal affairs. Rarely recognizes his mistakes and weaknesses, he fights to the last. Mind and caution Rats allow him to foresee further developments, and Scorpio’s courage pushes to decisive action. People of this combination of signs are innate leaders, and any other role for them is not good enough. Although sometimes abuse their power: Scorpio-Rats are rough and unrestrained. The life of these people is filled with bright events, their activities can only be envied. At the same time they need a secluded corner, they love their house very much, they seek protection and rest in it. Despite his militancy, Scorpio-Rat is a vulnerable person. This is a rather secretive person with a very complex character. He tries to appear as a brave and invincible warrior, while he may have doubts and worry about his own insolvency. The truth so carefully protects its secrets, that no one can penetrate into the depths of his soul. Scorpio-Rat is straightforward: it can calmly put into the face all that thinks. Therefore, people who want to talk with him are not so much. In general, Scorpion-Rats are friendly people, open to communication. But they love to dominate others too. The people around should rather just have to agree with their point of view. They have a strong intuition, they easily recognize falsity and pretense, it is impossible to deceive them. Naturally, with liars and traitors, the Scorpio-Rat will not stand on ceremony: they will try to get rid of them. In matters of honor, they are principled. By their nature, they are honest people who uphold the truth to the last. Just a little stubborn, sometimes — quick-tempered and always — powerful. But they can be entrusted with any secret, people of this combination of signs are not capable of baseness. Do not intrigue and blabber other people’s secrets. In a romantic relationship, Scorpio-Rat does not give up leadership positions, is ready to do anything to prove his superiority over the rival. Most likely, it will be an open confrontation, not a subterfuge. Of course, if we are talking about a man, and a woman will try to attract attention more sophisticated actions. This can be both easy coquetry, and whims, and gentle care. Undoubtedly: Scorpio-Rat, regardless of gender, will definitely achieve reciprocity. Despite their strength and courage, people of this combination of signs need support. Desperate to seek salvation in the family, ready to roll mountains for loved ones. For Scorpio-Rats, life becomes meaningless if they do not see a goal, and the family is an eternal source of inspiration. These are very caring and loving people, true, the homeless must obediently obey their decisions. Sometimes they are unable to contain their irritation, they give out directions in an orderly tone, but they can not otherwise. Energetic Scorpios-Rats are not afraid of the hardest work, but they dream of a leader’s chair. Born to manage people, love to command. They have sufficient flexibility, they are able to make decisions quickly, so they are difficult to catch unawares. Scorpion-Rats show themselves as responsible, hardworking workers. At the same time they are stubborn, without a measure ambitious, tend to overestimate their abilities. It may well be rude to employees and superiors. Scorpios love everything mystical, and Rats — mundane nature, prefer to solve pressing problems. Therefore, these people tend to trust their intuition, try to recognize the signs that fate sends them. At the same time they are very hardworking and are focused on the result. Whatever sphere of activity Scorpio-Rat chooses, it will necessarily take place as a professional. He can lead a large team, he can organize his business or become a great actor. In any case, success is guaranteed to him. The Scorpio-Rat man has a strong, complex character. It is almost impossible to find a common language with such a person, but his good attitude is priceless. A reliable man will always come to the rescue without asking any unnecessary questions. But it will not even allow friends to interfere in their affairs, especially in private life. All important decisions are made only by himself, act quickly and decisively. He is quite capable of organizing his own business without outside support. 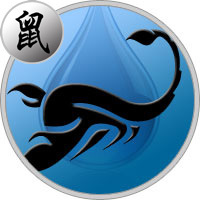 Scorpio-Rat is a man who does not recognize the superiority of even a loved one, the chosen one must respect his opinion. The decisive word always belongs to him, only in this case the marriage will be long. The purposeful woman of the Scorpio-Rat admires her decisive actions. It seems that she is devoid of weaknesses, always ready to fight. With laudable perseverance, she moves to her goal, sees himself as a leader, but no less. Her energy is enough to solve business issues and personal life. Alone with close people can afford to relax a little. He loves travel and active rest, it can not be called a home-stay. Carefully takes care of the family, adores the children, the Scorpio-Rat woman is a wonderful mother. She will be happy with the man who shares her hobbies and interests, recognizing equal partnership.